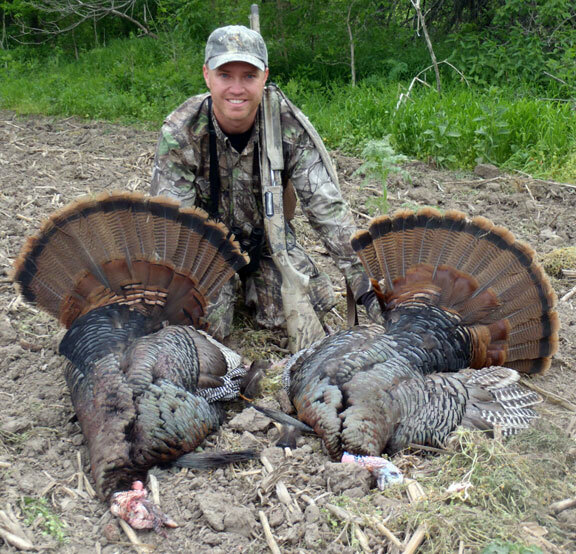 On many spring turkey season wild tom hunts the first hour or two is prime. During morning gobbling period of peak hen receptiveness is as true on our private land as elsewhere. Typically, a result of hunters living in morning hunt only states rather than hunters from all day long spring season localities. Day long hunters have more opportunity to study his toms developing additional success techniques. One beauty of Kansas is you can hunt all daylight. One more option. A capability to learn patterns far more thoroughly than those who just study morning behavior. Those with several seasons of afternoon Kansas turkey hunting under their belt have had consistent good luck between 12 and 3 pm. Attractions are toms continue to be prowling. Typically not henned up. PM strutting areas are habitual even if for only a short string of days. Part of that habitual behavior is linked to hen’s nesting. During egg laying or, pre nest sitting behavior a second feeding period starting as early as 11 AM running through 3 PM drive hens to fields towing toms. A classic example is a hen which gets serviced at first light. She moves off for a drink then some quick feed. Soon later lays an egg. She is back grazing a greening up fields. Toms have these hens timed and a strutting area is developed. A pattern repeated many times over during Kansas turkey season. Just like mature deer, mature gobblers seem to know when a best time is to move with least amount of human activity. We don’t know for sure if it’s a primary reason for their movement. However, it definitely makes sense. We all have seen how fast a turkey can run when they are spotted. Another factor contributing to afternoon Kansas turkey movement could be it’s time when hens begin sitting on their eggs. A more late May part of spring season. Or, when gobblers prowling finding fewer prospects. Any time toms are not following a hen is always a plus for every hunter. A more frequent observation during Kansas’ long turkey hunting season (8 weeks) than elsewhere. 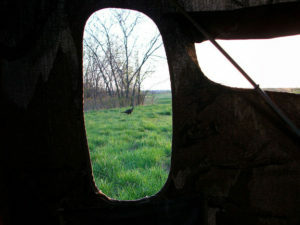 Long spring days wild Kansas spring turkey season hunting can be extremely difficult if not using a blind. A majority of Kansas turkey hunters we have talked to who do hunt from dark to dark do so from a blind. They have reported seeing as many turkeys on during afternoons as they do their first couple hours of any morning. Those who do not hunt from man made blinds are split between those that erect natural cover blinds to those who set up in thicker surrounding brush. Kansas’ plentiful cedars make this possible. Few purely stalk without any more camouflage than what they are wearing. When digging into how these stalk hunters developed their skills they all to a man started chasing turkeys long before they could get driver’s licenses. A distinguishing aspect of blind over non-blind users seems to be largely based on where someone grew up leaning their turkey hunting skills. Local are far more likely to use a blind. Those living in south, southwest and northern to eastern big woods states less likely to employ a blind. One hunter distinguished this observation describing Kansas hunters learn quicker where roost, feed fields and water source all work towards keeping 12 hour day flock movement to a predictable pattern in a relatively small area. An area easily discern able to place a setup. This observation is frequently compared to some other heavy cover states where regular near to long distance observation of flock movement is rare. 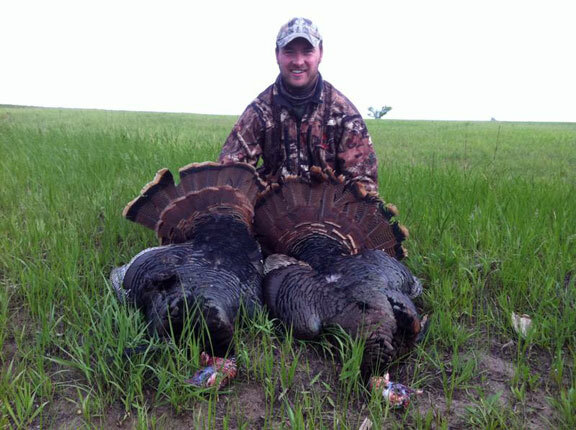 An effect is Kansas turkey hunters find through adapting their observations to local terrain is simply more eyes on all birds. Not just toms from a flock. Eyes on is repeatedly so during every field day. Those blind hunters who do move further describes such moves as from one concealed position to another simply as a reaction to short-term changes to daily flock routine. To further support these collective comments is our seemingly casual conversation with those who make the most reservations before tagging out. Bulk of this group fall in two categories. First, is a relatively new hunter. Second, is one who describes how he is more a run & gun hunter. Yes, this turkey hunter is more likely to travel from hilly/wooded or thicker scrub country. He is likely to take longer to fill a Kansas tag. If having a couple of days for a trip it is very helpful to scout throughout anyone’s first day. Become more familiar with patterns. Determine their primary food and water source as well as nesting area. Pinning down an unknown return to roost for the next morning’s hunt is a bonus. 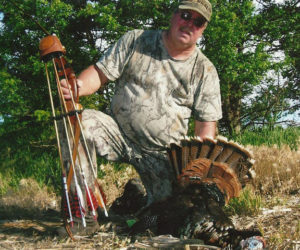 Southern Kansas turkey hunters find a regional cover difference. Likewise spring must tactics change to adapt to different terrain. Eastern Kansas regions of more woods allows more concealment. In all areas wheat is prime. A constant to be counted on. Kansas green wheat seems to be a primary food source both early morning through mid-day throughout Kansas’ season. Distinctive from our Iowa or Missouri preferred food of fresh bean sprouts. When a wheat fields grow past a foot tall flocks tend to shy away from them during morning hours. Some say the reason is cold wet dew held by tall grass makes them uncomfortable. They do not like being wet their first morning hour or two, especially if cool temperatures prevail. When sun dries morning wheat by middle morning we’ve heard turkeys use wheat, but decoys may not be visible. This is just a thought we would like to pass on to those interested in feedback we’ve heard from our Kansas hunters over many years. While at this point it may appear we speak of wheat fields a lot for Kansas turkey, it is Kansas has a lot of wheat. Turkeys do use wheat for much grazing during early half of spring season. No experienced Kansas turkey hunter will pass a wheat field without at least a glance to see what is there. Another observation by our self guided Kansas turkey folks is if turkeys do not get pressured. They tend to fly down to open fields moving to timber or tops of ridges by mid-morning. Then slowly work their way back to open fields mid-day. A second feeding if you will. With this in mind connecting these dots with aerials before a hunt may work. Anticipating movement of hens to nest areas, water, forage, strutting, roost, as well as a day spent scouting may payoff with a quick harvest. Or, a chance at being selective on a big tom. Rarely while on a hunt does someone just stumble into a flock or individual toms. Turkeys have nothing but time. They constantly seek something to run from. With this in mind, sitting all day is an advantage. It may be foreign to many ridge runners or public land hunters. This advantage is largely made possible though non-pressured private lease land. This leaves it to MAHA hunters to run any turkeys off the farm they are on. One hunter told us a tom’s biggest fear is a human on foot. If they don’t ever see a human they are much easier to work.